Visakhapatnam Port Trust (VPT) has published recruitment 2017 notification for 01 pilot (CL-I) posts. All legible and interested candidates can apply on or before (10-03-2017). Further more information about salary details, application fee, educational qualifications and all other details / information about this post is mentioned in detailed below. 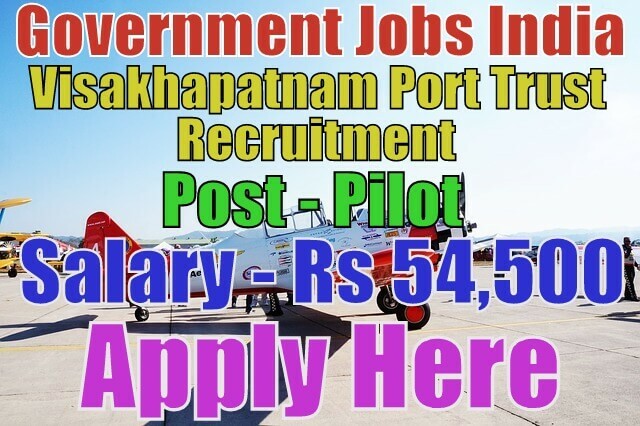 Salary/Pay and Grade Pay - For pilot post, the payable salary will be Rs 29,100 - 54,500. Further more information about salary details is mentioned in detailed advertisement. Educational Qualifications - For the post of pilot, candidate should must have done 10th, 12th, graduation degree, must hold a certificate of competency as master of foreign going ship issued by the ministry of shipping government of India with one year post qualification experience as master / chief officer of a foreign going ship or it's equivalent / relevant / higher qualification from a recognized board or university. To know more see advertisement. Selection Method - For port trust vacancies, candidate will be selected on the basis of their performance in personal interview. Candidates must be prepared for personal interview. After downloading and filling the application form candidates have to send application form along with needed / relevant testimonials(which is mentioned in detailed advertisement) super scribes "Application for the post of Deputy Fire Adviser" to the given desired address. Last Date for Submitting Application Form - All candidates should must apply on or before (10-03-2017). Application Fee - There is no fee for any category candidates.